It has been excruciatingly hot here in NYC, pushing 90 degrees with extreme humidity. 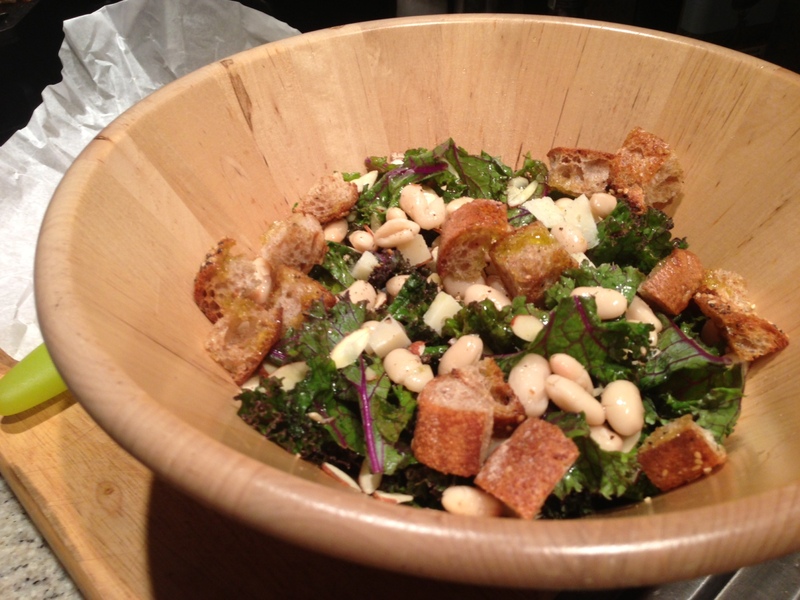 This heat wave has made the idea of cooking nearly nauseating… but for the sake of the blog, I turned on the ol’ oven this weekend and cooked up some croutons for a delicious and filling tuscan kale salad. 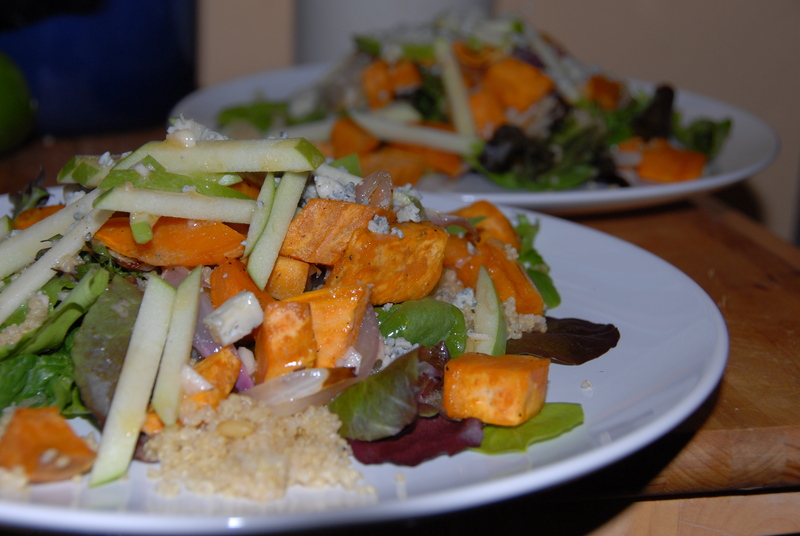 Thankfully the croutons were the only ingredient in this recipe that required any cooking at all… otherwise I may not have lived to write this post. 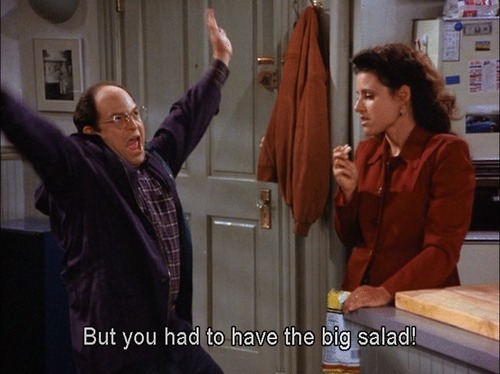 Put the kale and a pinch of salt in a large salad bowl, “massage” (as if you were rubbing the kale’s shoulders) the kale for 5 or so minutes, or until tender and slightly wilted. Add the beans, cheese, almonds & croutons and toss together. Dress with a little olive oil and white wine vinegar, and season with salt & pepper to taste. 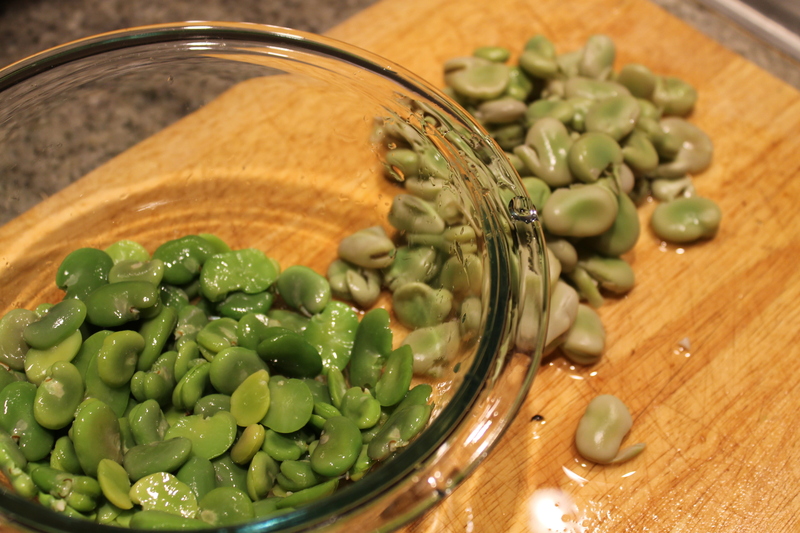 Hillary said it – double peeling these favas is an act of true love and dedication. These bright green beans are truly bright and refreshing though – so I think they’re worth a little extra attention – and really, it’s not that bad. 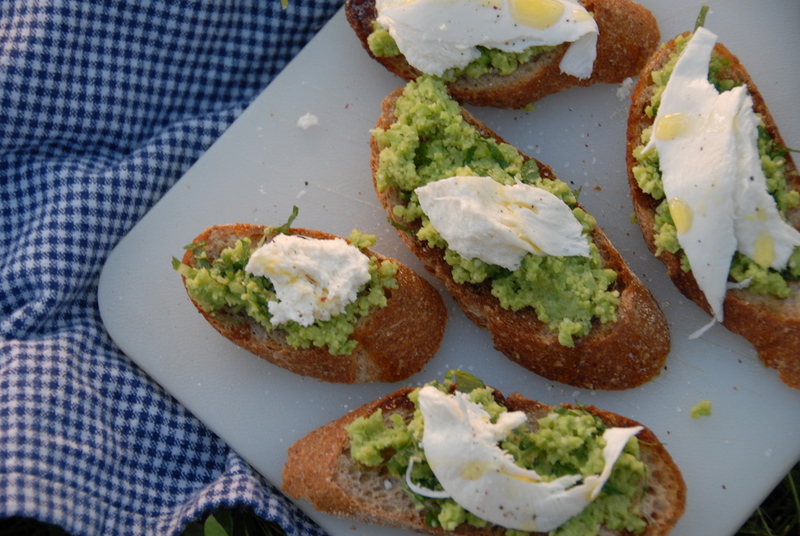 I made these incredibly easy bruschetta for a lovely al fresco dinner by the river. Just perfect for a Spring picnic! Simply prep and pack all the ingredients separately and assemble outside, pair it with a crisp glass of cold white wine (or a refreshing beer like we did!) and enjoy! 1 baguette (I used whole wheat…not bad!) – sliced thin, lightly toasted with a sprinkle of salt, balsamic vinegar and olive oil. Assuming you’ve gone through the process that Hillary outlined (boil the favas and peel them, twice) – transfer the favas to a food processor and process with salt & pepper, olive oil, lemon juice, and garlic. 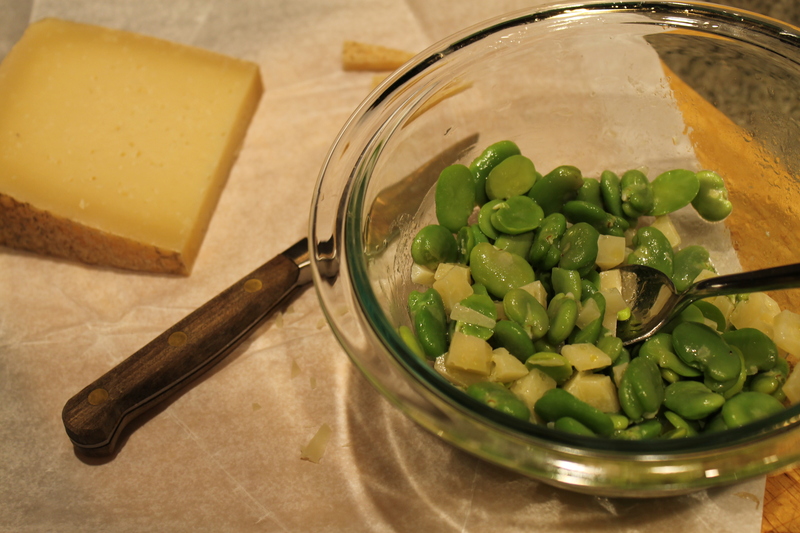 My fava mixture never got totally smooth, but I like having a little texture to the smashed favas. Taste for seasoning and mix in the finely sliced fresh mint. For the bread – preheat the oven to 400 degrees. Thinly slice the baguette and sprinkle with olive oil, balsamic vinegar and a little salt. Toast until slightly crispy. To assemble – spread the fava mixture over the baguette slices. Top with shredded mozz, another good dusting of salt and pepper and top with lemon oil. 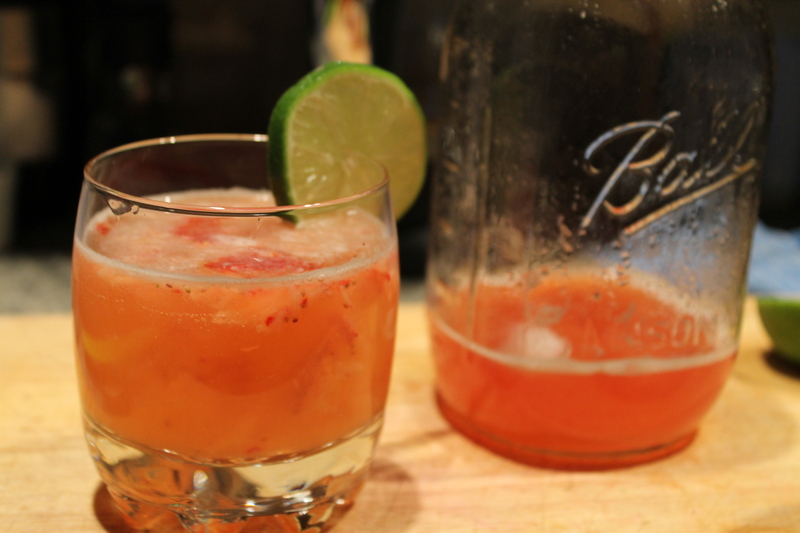 Light and oh-so-Springtime! A fresh fava bean salad is such a delight on a hot day with a cool glass of wine… and yesterday was certainly a hot day here in NYC, up in the mid 80s with extreme humidity. Shell the beans and blanch for about 2 minutes in salted boiling water. 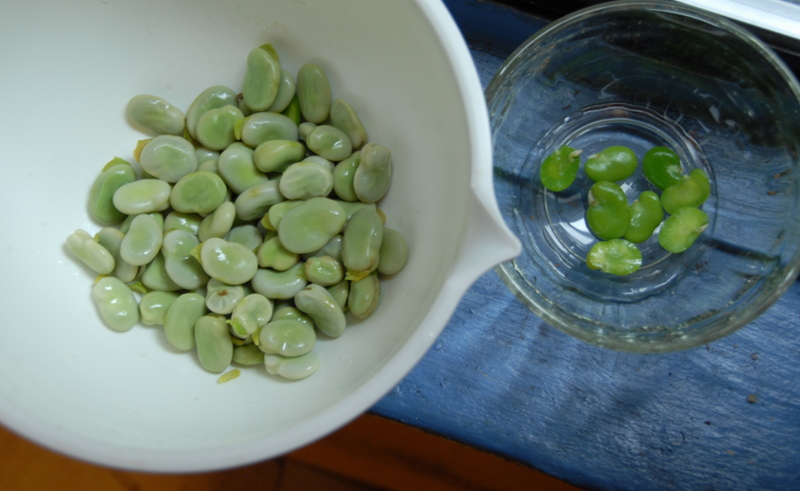 Remove their tough outer skins and reserve the beans in a small bowl. Add the cheese, a splash of white wine vinegar and a drizzle of olive oil, season with salt and enjoy!